In delightfully ironic ways, Deadbeat Heroes pokes fun at the foibles of comic book tropes. The dashing heroes. The ineptitude of archetypal villains. The witty one-liners. All delivered in a flavor of funny that’s distinctly British. 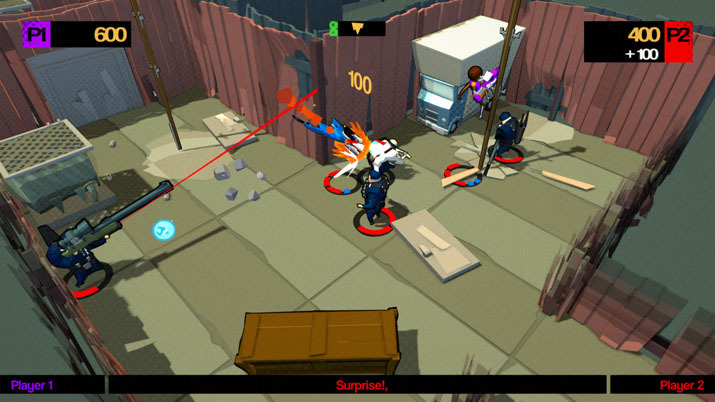 For those who like meta-comedy, satire, or self-deprecating humor, the tone of the game is perhaps its greatest asset. “Being a hero isn’t just about winning, it’s about putting on a show,” says Captain Justice to the cast of playable characters, a motley band of underling heroes. It resonates. How often do we see superhumans sacrifice practicality for panache? Think about it: ‘sharks with laser beams’ is a recognized cliché. Beyond just being amusing, the Captain’s words shape much of the gameplay. It’s not enough to beat a level: you have to look cool doing it. The technical function of this is that the gameplay is made more challenging. In order to complete a mission with a passing grade, you have to do more than make it to the end of the level. You have to earn a certain number of points in the process. How you accomplish this isn’t explicitly stated, but as you play through the initial levels you discover how to accumulate points by ‘juggling’ mobs. That is to say, minimizing the time between attacks. You also get cool points (they’re not actually called that) for clearing a room without losing health. And of course, points abound for picking up the dank superpowers extracted from supervillains. (This game could also be summarized as pointillist Kirby battles a mob of ironic supervillains). The quickest, most efficient way to beat a level is never the flashy way to do it. You often have to compromise tactical, cautious strategies in favor of performing ridiculous, button-mashing stunts. In other words, it’s not good enough to do something; you have to know you look good doing it. Conceited, much? It’s a bit like looking at yourself in the mirror while boning — and, given the context of the game, I’d say it’s an appropriate analogy. There is something conceited about labeling yourself a hero. I’ve never looked to a video game for validation, but dang, feelsgoodman. 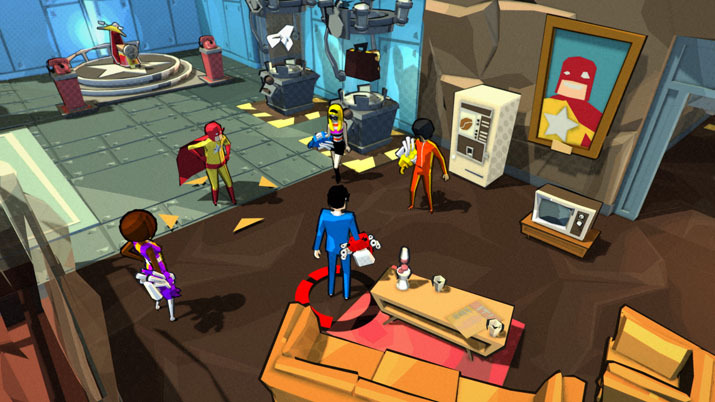 Deadbeat Heroes is indulgent in the way that old-school comic books and arcade games are. In fact, those two mediums appear to be the wellspring of inspiration behind the game. Rather than a killcam, your most glorious moments are captured in snapshots reminiscent of a panel in a strip. Over-the-top onomatopoeia makes these cuts that much more satisfying, while Ben-Day dots crystallize into shadows and stylized characters move through a straightforward brawler. The twanging groove of 80s R&B funk is amplified by the simulation of a live audience. These invisible fans react to the combat in real-time, gasping at your losses and celebrating even your smallest victories against opponents. The intensity of your combo moves is highlighted by ascending, brassy chords. The game’s look, sound, and feel are meant to gratify. It accomplishes this through cool points, banter, regular applause, and snazzy-but-functionless superhero vehicles. Gratification might also explain why the cast of heroes is composed of civilians. They’re completely ordinary, just like us. Your character has no innate abilities, but instead is bestowed with a glove that grants them superhuman strength and speed. Equipped with your handy-dandy power glove, you can execute double jumps, dashes, wall runs, and a variety of strikes. Most of your time is spent fighting variously armed goons who drop ‘turbo balls’ when hit. Collect enough of these and a power-up becomes available that then allows you to deal damage to a supervillain (or their lieutenants). Each carries a unique power that then becomes yours for a limited time, allowing you to fend off wave after wave of Frankenstein-like minions. From the bitter and broken-hearted Cold Shoulder to the telepathic Mindy Powers, each villain comes armed with a wacky theme and equally campy dialogue. However, even with the range of superpowers that becomes available to you, the combat system doesn’t evolve much after the third of fourth level. New characters are introduced, but nothing differentiates one from the next except for the avatar’s skin and their set of one-liners. (“’Betty.’ That’s a pretty name.” “My father was something of a gambler”). Without new challenges, or an intriguing narrative to fall back on, the title stagnates slightly. 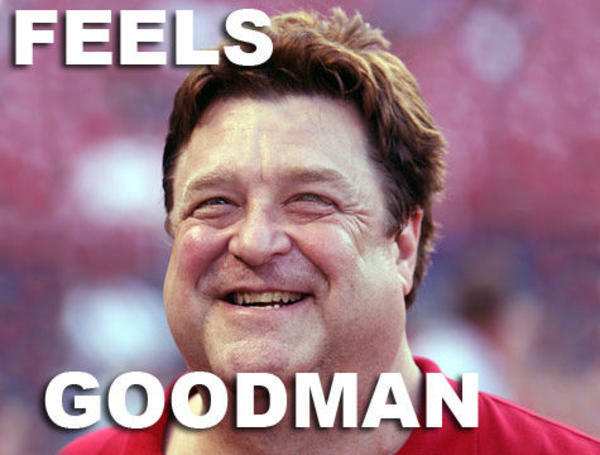 It relies on humor to carry it through; not gameplay or level variation. The aforementioned ‘cool point’ system was a smart touch because it encourages players to do more than just skate through levels. It forces you to play by slightly different rules, with slightly more finesse. But by the halfway point, you’ve probably mastered the controls. So while there’s a satisfying period of fluidity, that later gives way to redundancy. Defeating the last few enemies is hardly more than a non-action, a product of muscle memory.